We gather here again in a spirit of gratitude to God, the one who is the keeper of life and the source of every blessing who makes all things beautiful in its time (cf. Eccl 3:11) for the 6th Convocation ceremony of Veritas University, Abuja (The Catholic University of Nigeria); to celebrate students who mark the end of a journey and the beginning of another and to cherish the fruit of their years of hard work and commitment. The occasion also marks the 10th Anniversary of the establishment of the University. It is noteworthy that the Provisional License to operate this University was given in May. 2007. 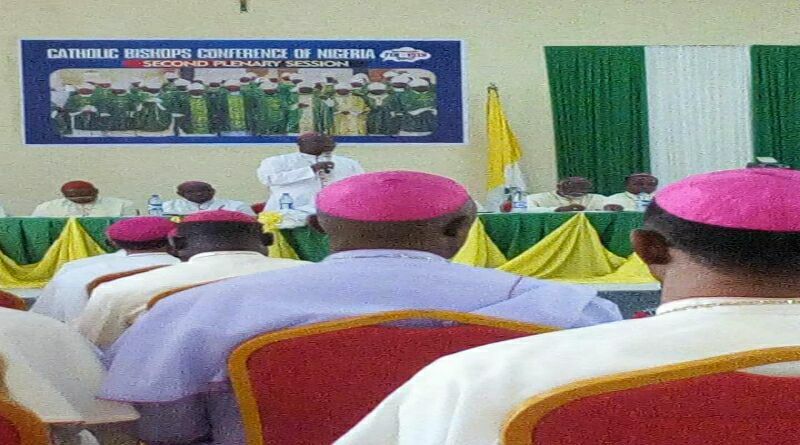 On behalf of the Catholic Bishops Conference of Nigeria (CBCN), I wish to appreciate the past and present Management as well as staff of VUNA who have demonstrated sincere commitment and remarkable selflessness in service to bring about the numerous achievements recorded, especially in the past academic year but also since the past 10 years, symbolized by the dynamic administration of the present Vice Chancellor, Prof Mike Kwanashie for the pioneering work and their dedication to duty in the effort to distinguish the University as a special and privileged institution of higher learning in Nigeria. We pray for and expect greater hard work and commitment from all those who serve in this institution in whatever capacity. May God bless and sustain you in good health and sound mind. Our University is a Catholic University and should provide a fertile ground for learning for serious minded students who, while receiving spiritual and moral formation, want to excel in their academic pursuit. It should also be a place where those who get appointed to work in Veritas University should see their appointments as a call to serve without ethnic, religious or sectional sentiments. I therefore charge the management, staff and students of Veritas University to remain focused, committed and to see VUNA as a family. 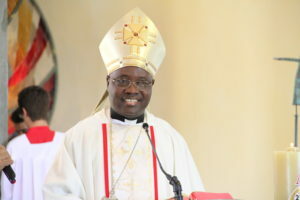 While it is no news that many Nigerians prefer identifying with only their culture, region or religion rather than the national common good, we must realize that the word Catholic means universal and should make Veritas a home for all, whether we are a minority or majority, from the North or South, East or West of our nation where the values of our common humanity are taught. It is imperative to change our attitude and to put the national interests and aspirations first. 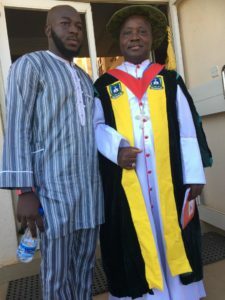 Veritas University is a cherished asset of the Catholic Church in Nigeria and should not be used by anybody to pursue ethnic or sectional agenda. This University should be an icon where other institutions in Nigeria and beyond can emulate the values of hard work, responsiveness, dedication to duty and respect for authority. 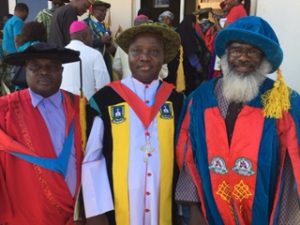 The members of this community must therefore avoid the negative tendencies in other institutions of higher learning like ethnic and sectional bickering, desperation for power, internal wrangling, incessant strikes, molestation of fellow students, drugs abuse, undue rivalry, ethnic cliques, the pull him down syndrome (phd), immoral practices like indecent dressing, anonymous letter writing against others, especially against the authority and unbridled ambition. Be positive rather than negative. We are indeed delighted to note that the University has continued to expand in terms of facilities, programmes and student enrolment. This commendable expansion will continue so as to meet the needs and yearnings of the Church and the Nigerian people. We would want to see greater interaction and engagement between VUNA and the Catholic institutions of higher learning, especially our Major Seminaries. 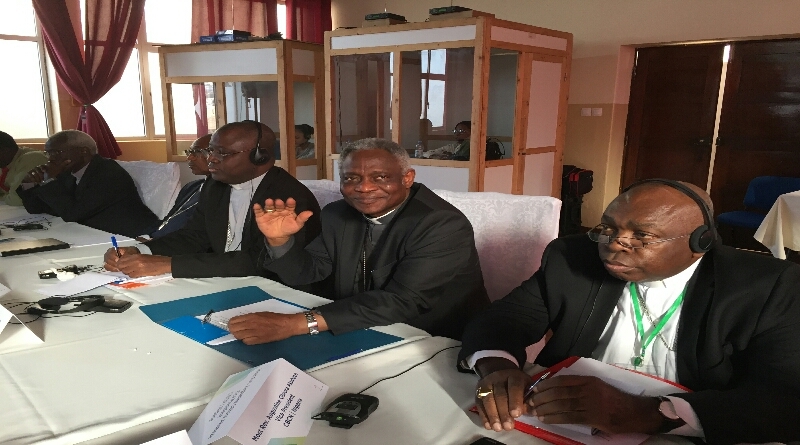 There is fervent need for the University to continue to sustain collaboration with other Catholic universities in Africa and other parts of the world. Such linkages are important in the advancement of truth in the expanding world of global connectedness. I am particularly delighted to note that the Management has responded positively to my earlier calls for the establishment of a Centre for Peace and Development. May I congratulate the University, for this feat. We hope that the Centre will indeed be at the forefront in Nigeria and beyond, in conflict resolution and peace building processes. The evil of violent conflict is clearly avoidable if there is an early response mechanism put in place by the relevant governmental and non-governmental organisations. We must realise that the project of ensuring peace and development in Nigeria is a project and duty for all Nigerians, especially now that the country is currently bedevilled by armed herdsmen, hate speeches, Boko Haram, militants, Kidnappers, and those who employ violence as a way of attracting attention to their cause. We wish to acknowledge the participation and generosity of our laity in embarking in some projects in the University. While the CBCN is the legal holder of this University, it must be understood that to develop the University and provide it with ultra-modern facilities, we need the active participation and cooperation of all. 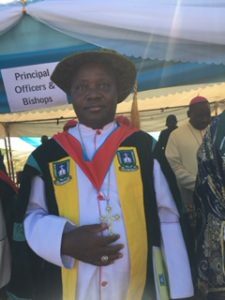 While some lay organizations have already demonstrated such generosity by embarking on some laudable projects or making commendable donations to the University, we call on dioceses, religious congregations and materially endowed men and women to join in creating a brighter future for our youths through what Veritas University intends to offer Nigeria. On this note, I wish to thank the Federal Ministry of Education, the National Universities Commission (NUC), the Joint Admissions Matriculation Board (JAMB) and others for the support given to VUNA so far. I also commend my brothers, in the Catholic Bishops Conference of Nigeria (CBCN) for their efforts in ensuring that this dream is actualized. Particularly, I wish to thank the Archdiocese of Abuja for being a very good host. The Zuma and Gaba Communities deserve a special appreciation as our landlords. I therefore urge them to continue to support and secure the University as I call on the Federal Government and the Federal Capital Territory Authority to continue its support to and collaboration with the University. Finally, to the graduating students of VUNA, I congratulate you as you leave this campus and launch out into the wider society to start your life. I challenge you to put into practice, all the virtues, all the life skills, survival strategies and the diplomacy of interpersonal relationship which characterized your training in this University. Be brilliant stars, the hope of Nigeria and indeed the world, a world that seems to be in darkness, and a country assaulted by incurable corruption and many social vices with crippling negative consequences. As fruits of the noble dream of the Catholic Church in Nigeria, you must offer yourselves as living sacrifices acceptable to the Lord and to Nigerians. Your actions must always reflect what Veritas stands for, which is truth. Through your actions, VUNA will be rated and valued. Mt. 5:16 says: “be a light shining in the dark. We cannot become defeatist by saying that corruption, mediocrity, ethnocentrism, bad leadership, political recklessness etc. should have the last word. I pray that the huge investment of the Church and your parents/guardians and lecturers in your formation will be rewarded by the fruits of your labour. Go into the world as men and women of honour and virtue and bear fruits that will last for Nigeria and indeed humanity. May the Lord go with you and be with you in whatever you do. As we seek a veritable way to build a solid and united Nigeria and to make ours a country more secure, prosperous, just and healthy, we appeal to all those vying for public office or leadership positions must give the youth a chance to contribute their quota. Unfortunately, the whole process is so monetized and inspired by god-father syndrome that those with the ability, the wisdom to bail this country out of its economic and political predicaments are forced to dance outside the circle while those actively in the frontline of politics are those who have been at it for decades and are so unwilling to allow fresh blood, ideas, and strategies to be injected into the political nervous system. Money, power and influence define and determine who become our leaders. As we send our graduates out, I invoke the blessings of God upon you to help you always do only those things that are good with a high sense of patriotism. I charge you to go to the ends of the earth and make us happy and proud while wishing you a future filled with uncountable blessings and success.